I love Kelly Light’s Louise Loves Art. I think it is the most “must own” picture book published in 2014. Each and every classroom, school, and home library will benefit from including Light’s masterpiece on its shelf. 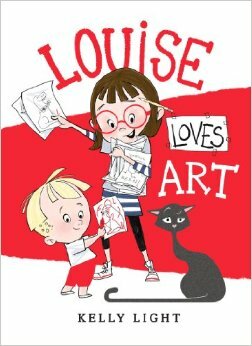 I’m suppose to write a review of Louise Loves Art for today’s #SharpSchu trifecta, but I’m not really sure what is the best way to convince you about this books brilliance. I could go on and on about the beautiful illustrations, and the brilliant and bold use of the color red. I could share the heart warming relationship between the two characters. Maybe I could share why I think this book should be in every art classroom. Hmmm…I’m sort of stumped. How about instead of telling you about this awesome book, I’ll share with you a few tweets from Kelly that I think help show her brilliance and how important she is to children’s literature? After reading Louise Loves Art I tweeted Kelly about when I stopped drawing as a child. You can find part of that conversation below. @colbysharp Do you remember why you stopped? It’s never to late to pick up the pencil. @colbysharp we each take in everything around us,then our ideas travel down our arms, thru our pencils and are as unique as each of us are. I’m hoping that Kelly’s work helps all educators, parents, and children understand that we are all unique and wonderful artists. Kelly helped remind me that I don’t have to draw like..Kelly Light to have value as an illustrator. Be sure to visit Mr. Schu’s blog to read his interview with Ms. Light. Kelly has written a beautiful Nerdy Book Club essay.